Google recently announced that the new Gmail “Compose” experience has become the default. anyone else struggling with the new Gmail “compose email from your inbox” function?Not a fan. Thankfully, with Texbox.io you can solve the major problems that have been introduced with this new design and get a host of new features. Our browser extension for Chrome and Firefox provides a set of powerful writing tools that restore some sanity to the new Gmail Compose. 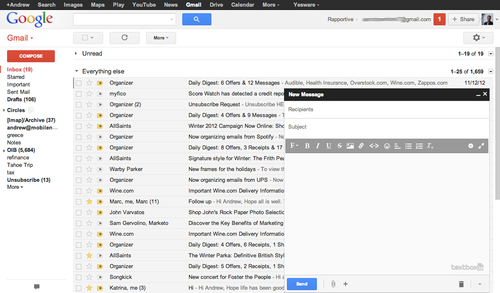 Gmail’s new interface has shrunk the size of the compose window dramatically. Many Gmail users report that focusing in on an important email is nearly impossible. I detest the new compose in @gmail – Why must I write emails in a small corner of my screen? The center of the screen was just fine, thanks. Textbox.io overcomes this with a full-screen mode that lets you focus on writing in a pleasant and distraction-free environment. You can toggle the full screen on and off with a quick shortcut (Command + Shift + F) or via Textbox.io’s toolbar. The new Gmail “compose” & “reply” features are making me want to stab people. Smaller window, extra clicks to format or show quoted content. Textbox.io, again, is a great way to get around this limitation. Textbox.io’s formatting toolbar is where you would expect it on the top the compose window. You’ll have no trouble finding essential formatting commands or how to add images, emoticons or hyperlinks. We also offer markdown, where you can use a simple formatting syntax whilst typing. This is even faster than using the toolbar. Try typing *word* and see what happens! Canned responses were a useful Gmail feature for saving and inserting common messages. It can be very useful for sales or support people who often find themselves repeating common emails. This feature is now extremely well hidden. So much so, that most people think it is gone. With Textbox.io snippets, canned responses are even easier than before. You can save templates or signatures and setup easy short codes that get expanded when you type. Textbox.io solves the major complaints with the new compose experience and gives you a whole lot more: 9 ways to insert photos, 800 emoticons, 4,000+ typos autocorrected, link previews and much more. Ready to get started? Textbox.io is available as a Chrome extension and a Firefox addon. All you have to do is install the browser extension and visit Gmail – that’s it. We hope you enjoy both Textbox.io and the new Gmail Compose. We think it is a winning combination that gives you a far better email writing experience than ever before! Watch our video to learn more about how we can help you with the new Gmail Compose. UPDATE: the Textbox.io browser extensions have been discontinued. You can continue to use the great Textbox.io features in your own application via the SDK.